Price is for settings only. Select your diamonds from our extensive online inventory. Simple, elegant and always beautiful – diamond stud earrings are a classic gift choice for any occasion, and for any age. That’s because diamond earrings are an essential and versatile part of any woman’s (and some men’s) wardrobe. They always fit the occasion – and uplift any mood – from denim to dinner parties, from boardroom presentations to an evening at the symphony, and everything in between. Since diamond earrings are worn so close to the face, the flash of a precision-cut stone will complement and enhance her (or his) appearance. And when you choose diamond earrings set with Brian Gavin Signature Diamonds, you can be that you’re getting diamonds cut to the highest quality and performance standards in the industry – diamonds that sparkle with brilliant inner fire under all lighting conditions. Diamond earring shape and size – Generally speaking, for any shaped face, round brilliant diamonds are a great choice for a stud earring. They’re a classic. 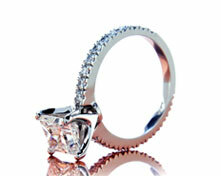 Broader faces may also wear the more square shape of a princess cut diamond. In any case, the size of the diamond should harmonize with the size of the wearer’s earlobe. Larger is not necessarily better. A well-cut, high-performing stone is always preferable to ensure the greatest brilliance and the best value. Metal Type – The type of metal you choose for the earring setting should blend well with the wearer’s skin color and tone. For warmer skin tones, yellow gold is a good choice. For cooler or neutral skin tones, white gold or platinum are goo options. Settings – Ideally, a diamond stud earring should fit snugly against the ear lobe. Three- and four-prong martini and basket settings work well and all have an elegant look. The metal is minimal to show more of the beauty of your diamond. Our settings at Brian Gavin Diamonds are handcrafted to Brian’s strict quality standards. Types of backs – Friction backs are convenient, easy to put on and take off. Our friction back earrings are notched on the posts to help ensure that the backs won’t slip off accidentally. Screw backs are less convenient, but make it much more difficult for a stud earring to slip off. For the highest degree of security for your most expensive diamonds, you may want to consider a locking, la poussette back. 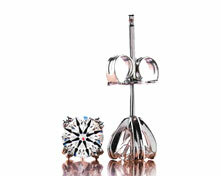 A variety of choices – Browse our site to find Brian Gavin Signature diamond earrings set in a range of mounts and styles, from princess basket studs, four-pronged baskets, three-pronged classic studs, martini and princess martini earrings, to handmade bezel studs, pear drops and princess drops. You’ll find different types of backs including friction and screw backs, lever backs, prong lever backs, and (locking) la poussette backs. At any time if you have questions or need assistance, please give us a call. We will provide you with the information and guidance to make the best choice for your loved one or yourself.